Profuse orange flowers adorn this climber, which hails from central and eastern Africa. In the warmest climates, you’ll be treated to a year-round bloom. In milder climes, the perennial vine blooms from late winter through fall, and in cool regions, its flowering season begins mid-summer. The nectar-rich, five-petaled blossoms entice hummingbirds and bees. Continuously growing in a clockwise spiral—which is responsible for its common name—this vine can cover 10 feet (3 meters). Herbaceous (non-woody) stems climb up and over supports and fences, or spread out and root in the earth, creating a lush ground cover. Triangular, deeply veined leaves are hairy, as are the stems. But the vine’s greatest feature undoubtedly is its profusion of bright orange flowers. Plant this spectacular vine in full sun (or partial sun in hot climates), and stand back to watch it cover a trellis, pillar, or fence. It can get by without much water once established, though it thrives in moist, fertile soil. It’s also fairly deer resistant. Although it is a perennial in tropical and warm-temperate areas, it may die back to the ground at below-freezing temperatures, resprouting and flowering the next growing season. Where winter temperatures dip below about 25 degrees Fahrenheit (-4 degrees Celsius), it can play a role in the garden as an annual. The hairy stems and leaves can be irritating and itchy, so experienced gardeners recommend wearing long sleeves when you cut it back. The Zoo’s Lost Forest has an especially exuberant example of orange clock vine. When you walk past the vigorously cascading twiner, you can easily imagine that you've stepped into the tropics of Africa. 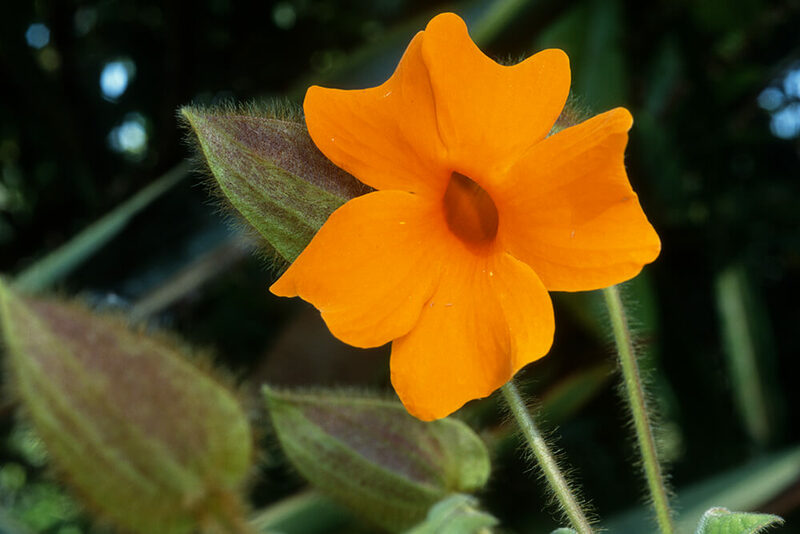 The orange clock vine’s closest relative is the familiar—and also clockwise-spiraling—black-eyed Susan vine Thunbergia alata, a southern African native. Some of the other Thunbergia species are invasive—under the right conditions, they tend to escape from the confines of gardens. In Australia, some are considered weeds. This plant genus, Thunbergia, is named for the Swedish naturalist Carl Peter Thunberg. In the late 1700s, he studied under Carl Linnaeus, widely regarded as the “father of taxonomy” (the branch of science concerned with classifying organisms). Thunberg later went on to collect and study plants in Africa and Japan, among other exotic destinations.